It has been a month since I last wrote, not because I had nothing to write about, but rather there were too many issues to discuss fully. What with, eastern Ukraine’s proxy war, Syria’s unrest sponsored by the CIA, Libyan boat people, Tunisian Terrorists, deaths in Kuwaiti mosques, French beheadings, a new Government in the UK., and Greece’s public spat with the ECB, Germany, the EU, the IMF and those behind the scenes pulling the strings. However, the potential Greek default appears to be the most concerning, and pressing. As the Greek government approaches the end of the debt issue, by calling upon its citizens to vote in a referendum on the final offer on the table from the Troika (The EU, IMF, and ECB), we have to ask ourselves is the end of the road for this can kicking contest in sight? The Greek people now have to decide in favour of its citizens by defaulting on its debt, and subsequently leaving the Euro or in favour of remaining in the Eurozone, and paying the Troika. Since 2006, Greek GDP has fallen by over 20%, and its debt is up by 50 percent to 320 billion euros. 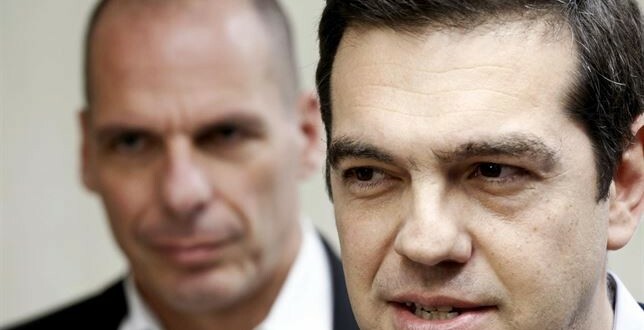 If Tsipras, and Varoufakis and the populace, choose the Greek people, the question will then arise as to whether Greece leaves the EU, and NATO, and accepts a deal proposed by Russia. The deal involves the Russians building a gas pipeline through the Black Sea, and either Bulgaria, or Turkey that will end in Greece. The pipeline would net the Greek government transport fees, and allow Russia to sell its gas to European nations. In the meantime, Russia would fund Greece’s public debts. Of course, the U.S. doesn’t want this to happen, as any extra revenue for Russian Gas, only strengthens Putin’s hand. The U.S. would prefer to build a pipeline from the Arabian Gulf, originating at Quassumah, in Saudi Arabia, through Iraq, Jordan, and Israel or if not Israel – then Syria – with President Assad finally out of the way…In other words – countries who are U.S. allies (or vassal states). America has been trying to cut off the finance from oil sales to Iran but has failed as China, and India, both rely heavily on oil from this oil-rich state. Turkey too, as a muslim state, has paid Iran a great deal in gold for its oil, and has over the last five years bought gold from its citizens to pay for this liquid energy. The gas field mentioned in the Arabian Gulf, found by Iran, who is the world’s largest gas holder with some 34 trillion cubic meters of exploitable reserves, allegedly holds some 11 Trillion cubic meters. BUT, the powers that be – (TPTB) – (think – the Fed, and its Bank owners – the Rothschilds, Rockefellers, Seifs, Warburgs, Bakers and Morgans et-al) have overseen a staggering $113 trillion increase in total debt worldwide. The global debt load has increased dramatically from $87 trillion to $200 trillion just since the year 2000. And they’ll need growth in western economies to meet those payments. The problem has got so big, yet TPTB, refuse to recognize the problem. They know that if they allow Greece to fail tomorrow, it will be Italy next, then Spain and Portugal, probably France then Belgium and eventually the entire financial system. A Greek default would not just lead to the 320 billion euros disappearing from the system because the lending banks and institutions are all levered up to 50-times that amount. But even if we only take a figure of 20-times leverage, it would mean that over 6 trillion euros could disappear out of the system. And yet, according to Dr Paul Craig Roberts a Greek default could – ultimately – prevent World War III. We shall see, as this can maybe has reached the end of this particular road.